The latest casualties in this era of fiscal austerity may be base swimming pools, movie theaters, golf courses and other amenities. 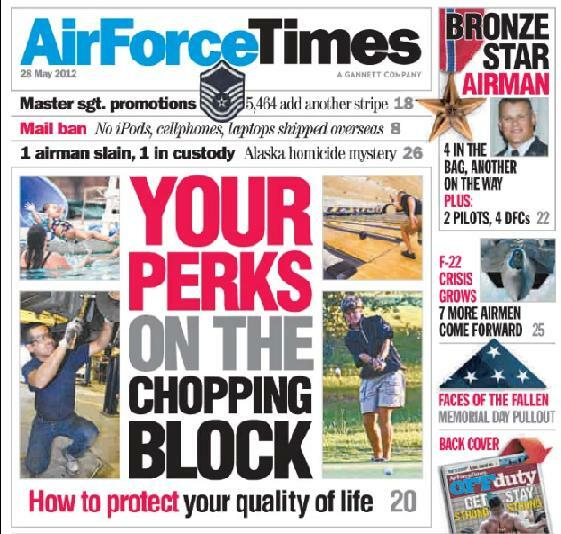 The Air Force wants to cut base amenities that aren’t making enough money, prompting the commander of the 81st Force Support Squadron at Keesler Air Force Base, Miss., to tell his airmen that underused recreational facilities are at risk of going away. “At a time when our activities are being threatened, usage rates and profitability will be determining factors when tough decisions are made,” Maj. John Ponton wrote on the base’s website in March. In other news, the Air Force has released the selection criteria for the KC-46A tanker, and that could be one of the most heated competition in years considering the service is facing the possibility of more base closures. Several bases are under consideration, and ultimately the Air Force expects to select 11 of them. The Washington state congressional delegation wrote a May 17 letter to Air Force Secretary Michael Donley in support of Fairchild Air Force Base being one of those selected to host the new tanker. “Fairchild already possesses much of the needed capacity to accommodate the new KC-46A aerial refueling tanker and the Air Force has already improved the 14,000-foot runway, invested in a new state-of-the-art fitness center, and last month broke ground on a new wing command headquarters that will better integrate active-duty airmen and Air National Guard airmen,” the letter says. And an Explosive Ordnance Disposal team leader has been awarded his fourth Bronze Star after he saved a soldier who lost both legs in a bomb blast. Master Sgt. Ronnie “Bo” Brickey put tourniquets on the soldier and vowed to go running with him after he recovered. Thanks to Brickey, the soldier has been walking on artificial legs for the past four months. Brickey expects to deploy again and that’s just fine with him.